Romik has been crafting premium running boards since 1956 in the finest European processes. 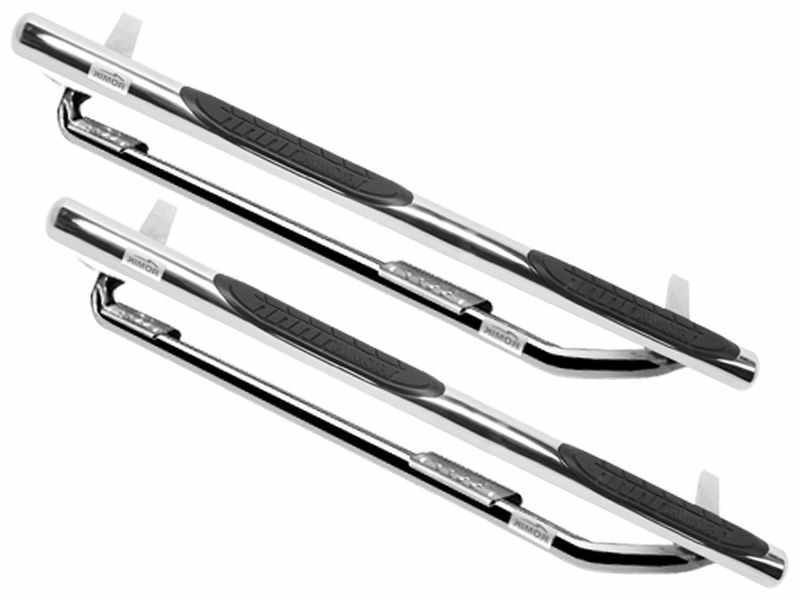 The Romik Stainless Max Bar Drop Step Nerf Bars are unique and offer unmatched style and functionality. The 304 stainless steel construction offers strength, rigidity, and corrosion resistance. The step pads are also above industry standard in durability, featuring UV resistant step pads on the main bar, and robust stainless step areas on the drop bar. Not only are the Stainless Max Bar Drop Step Nerf Bars durable they also offer additional safety. Both the bar and drop bar feature non-slip step areas. These bars also keep the side of your vehicle free from scrapes and dents when you cut it to close. Romik understands that running boards are often subject to heavy use and abuse. This is why their products are designed to be withstanding of these conditions. Romik warranties the Black Max Bar Drop Step Nerf Bars for 3 years. Important shipping information: Please inspect products as soon as you sign or receive them, if the product is damaged once you open the box PLEASE DO NOT INSTALL and contact our customer service and speak with one of our specialists so we can contact the carrier and process a claim. It is extremely important that this take place no later than 48 hrs after recieving of products.